Zoe, a Puggle, and her owner, Kate, are best friends. They share everything, even their food. After visiting the veterinarian, the doctor informs Zoe and Kate that Zoe is overweight for a puppy. "Fat Zoe" needs to go on a diet or else she will be at risk for health issues in the future. Upon learning this, Kate gets upset and confesses to her mom that the kids at school call her "Fatso" too and do not want to be her friend. Kate and her mom decide to tell the teacher, Mrs. Lopez, about Kate's situation. With Mrs. Lopez's help and the doctor's suggestions for a healthy eating and exercise plan, Kate and her family, Zoe, and friends begin to live healthier, happier lives. 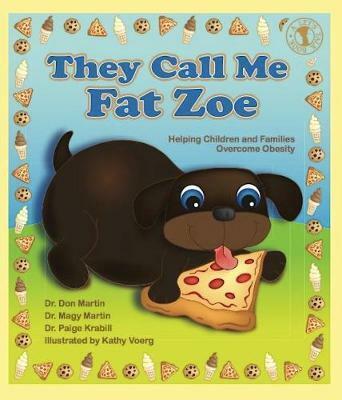 Dr. Don Martin, Dr. Magy Martin and Dr. Paige Krabill create a fun story through the viewpoint of a loveable puppy that confronts the difficulties of childhood obesity. At the end of the book, the authors provide suggestions and activities for children, parents and school administrators to help live wholesome lifestyles and prevent obesity. Dr. Don Martin has been a licensed psychologist in private practice for over twenty-five years. He received his Master's Degree from Radford University in VA and his Ph.D. from North Texas State University, TX. He is the coordinator of the school counseling graduate program at Youngstown State University in OH and a fellow of the American Psychotherapy Association. Dr. Magy Martin is a clinical psychologist in private practice and with her husband Don, has written over sixty research articles and four books. She received her Ed.D. from the University of Tulsa, OK and her Masters Degree from Colorado state University, CO. She resides with her husband Don in Beaver, PA. Dr. Paige Krabill has been a licensed school psychologist and director of special education services for several school districts. She is on the faculty of Cappella University in Minneapolis, MN. Dr. Krabill holds a Psy.D. from Miami Institute of Psychology. She lives in Minneapolis, MN.